Buy this! Buy this now! I love this album. Thanks to the good folks at Centricity, I've been listening to it for the last three weeks, and before that, thanks to the band "leaking" tracks on Facebook, I'd heard about half of it before my advance CD arrived in the mail. It's easily my favorite Downhere album to date. It's easily the best album of Downhere's career. And it's already been declared "one of the best albums of the year" by New Release Tuesday. I can't argue with that. The strength of "On the Altar of Love" is the sum of its parts. While no individual song on the album may be the best piece of music Downhere has ever done (and that's debatable - "Let Me Rediscover You" might be the new "A Better Way"), overall, this is an album filled with so many good to great songs that you will want to listen to the entire album over and over again. For me, any album with 3 or 4 really good songs is worth buying, and this album has no fewer than 10 songs (out of 12) that I'd stick in my "favorites" playlist on my iPhone. 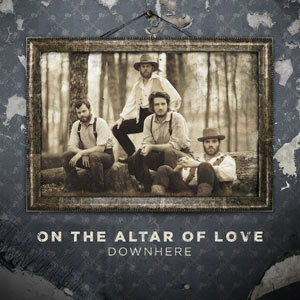 Hopefully, this is the album that introduces Downhere to a wider audience so that the rest of Christian music can discover what many of us consider to be the best kept secret in the genre: that Downhere is a great band, and deserve wider recognition for their music.